In March 2015 Sheldon Rostron was appointed head coach of the South African Women’s Hockey Team on a contract until the end of the 2018 Hockey World Cup, in line with the policies and procedures of the South African Hockey Association of appointing coaches on a world cup cycle. Following the completion of the 2018 FIH Vitality Hockey Women’s World Cup Rostron’s contract has come to an end and the process to appoint a coach for the next World Cup cycle is due to begin. Sheldon has elected not to reapply for the position going forward and thus ending his 3 and a half years as the National Head Coach. Sheldon was first brought into the national structure as a specialist trainer and goalkeeper coach in 2010 under head coach Giles Bonnet. In this time, he also performed various roles including stand-in assistant coach and team manager. Notable events amongst others under his belt with the national team are the 2012 Olympics, the 2014 Commonwealth Games, the 2014 FIH Hockey Women’s World Cup, the 2015 African Cup for Nations, the 2017 Hockey World League Semi Finals and the 2018 Vitality Hockey World Cup. As head coach Rostron got 57 caps, winning 22 and drawing 10 (as per the FIH TMS). The fifth placed finish at the FIH World League Semi-Final in Johannesburg that qualified South Africa for the 2018 World Cup was the outstanding performance in his time, where South Africa were desperately unlucky not to beat Germany in the Quarter-Finals. The South African coach also completed the remarkable double in 2017 when he coached the Men and Women to the African Cup of Nations titles, a double feat rarely achieved by a coach. Sheldon will now focus on his new role within the Sports Department at North West University, while a newly appointed coach will guide South Africa to the Hockey Series Finals in a quest to qualify for the 2020 Olympic Games. SA Hockey CEO Marissa Langeni thanked Sheldon for his service to South African Hockey. 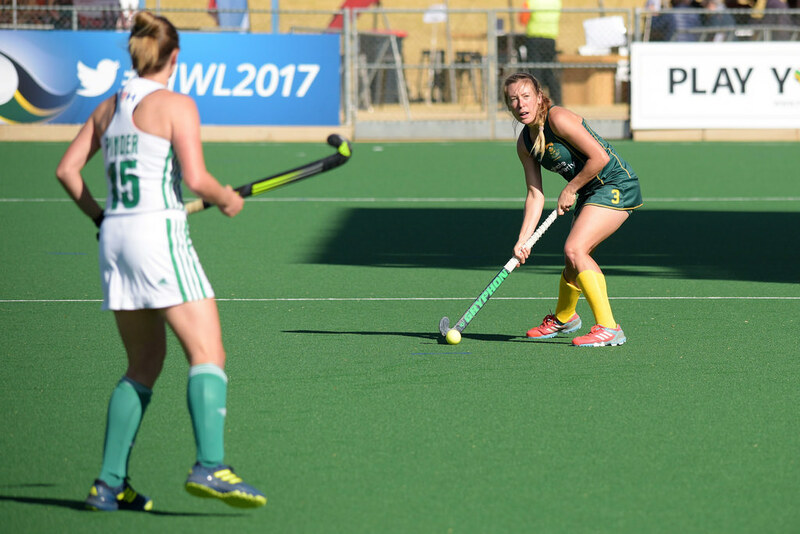 There was realistically more hope than expectation as Supergroup South Africa took on World number 3 Argentina in their final game of the FIH Vitality Hockey Women’s World Cup. The African champions had experienced a harrowing tournament so far falling short against Spain and Germany, to all but dispel pre-tournament optimism. The match marked the 250th match for South Africa for stalwart Lisa-Marie Deetlefs. If for nothing else the team would have been committed to making this a memorable match for the defensive star. And it appeared to be exactly the case as the Supergroup South African side put out a defensive masterclass in holding off an Argentina side that looked short of the regular magic. Phumelela Mbande will take most of the plaudits, rightfully so, as the player of the match was also undoubtedly South Africa’s most outstanding player of the World Cup. There may be questions about why she was subbed against Spain, but Mbande does her talking on the pitch and was on sensational form in not conceding from 13 penalty corners and at least ten further field goals. The biggest question going forward is how will Phumz manage here professional career and her sporting one, because she has become that important to the national team. South Africa’s strikers had failed to get on the scoresheet throughout the tournament so far, but Jade Mayne had made a menace in the previous games through outstanding movement and positioning. That it was her that got the goal through an opportunistic move and finish was almost a sense of inevitability as South Africa took a surprising 1-0 lead into the Half-time break. Simone Gouws, who made her debut only in the matches against Canada during the pre-World Cup camp, showed remarkable maturity and alongside the likes of Kara-Lee Botes, Erin Hunter and Deetlefs will continue to develop remarkably. 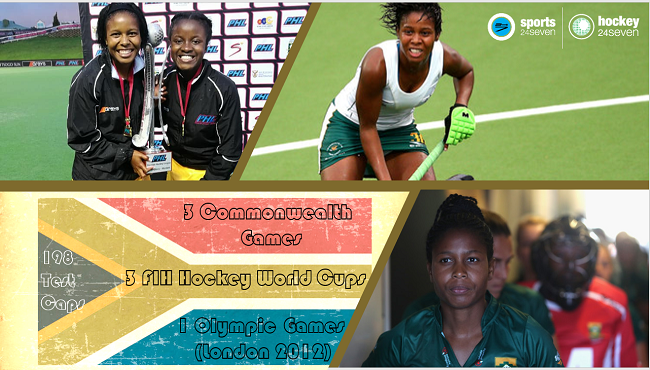 Her performance during the World Cup left a feeling of optimism for the future of SA Women’s Hockey. For all the defensive superlatives that were hurled South Africa’s way, the weight of pressure eventually did tell, and Argentina pulled level through Maria Granatto, they were not able to breach the defence again, in a display almost as effective as the mythological Trojans in defending their city. So, the South African World Cup dream is over for another four years, the team will have a lot of questions to answer and plans to make, but the performance and result against Argentina could be the catalyst of belief that drives us to another level. Supergroup South Africa took to the field to Lee Valley Tennis and Hockey club with only one thing on their mind. Victory against Spain was the best opportunity for Sheldon Rostron’s side to progress to the knock-out stages of the FIH Vitality Hockey Women’s World Cup. The side had shown glimpses of their game play ability in the opening game but were unable to convert chances and lost the midfield battle. Missing Nicolene Terblanche was going to make the challenge in the midfield even more daunting for the South Africans. The co-captain had been ruled out due to the concussion she received when she took a ball to the head in the opening game. Rostron would have wanted his team to show a dedicated start to the game, but it took just Spain’s Red Sticks a few minutes to exert their dominance. That dominance was converted into a 2-0 advantage, with Lola Riera’s unstoppable penalty corner drag-flick into the top right corner being complimented by a wonderful passing move that tore open the South Africa defence to enable Berta Bonastre to tap in. With the prospect of needing to beat Argentina in the final group game with defeat South Africa came out with renewed vigour and pulled a goal back in the third quarter through Kara-lee Botes. However instead of sparking the African champions into action the goal seemed to inspire Spain as the European nation produced scintillating wave after wave of attack. The South Africa ladies were unable to cope with Carlota Petchame, who netted two open play strikes of differing styles but both superb in quality before Carola Salvatella made it 5-1 with a close-range finish at the end of the third quarter. Spain continued their outstanding form throughout the fourth quarter, with their excellent penalty corner routines resulting in further goals. Riera made it 6-1 with another ferocious flick into the roof of the South African net before Bonastre joined Riera and Petchame as players with a two-goal haul from the contest with another set-piece before the end. The result was a devastating blow for South Africa that left their World Cup dreams in tatters. Although not impossible the team now face a daunting challenge of having to beat Argentina and overturn a goal difference disadvantage as well. Lee Valley Hockey and Tennis Centre in London played host to the opening game of the 2018 FIH Vitality Hockey Women’s World Cup as SuperGroup South Africa took on Germany. The two teams took met at the FIH World League Semi-finals in Johannesburg last year and South Africa would have been motivated by that near miss. But Germany were up for this game and in truth dominated from start to finish with a superb pressing display to limit the South African possession and chances. 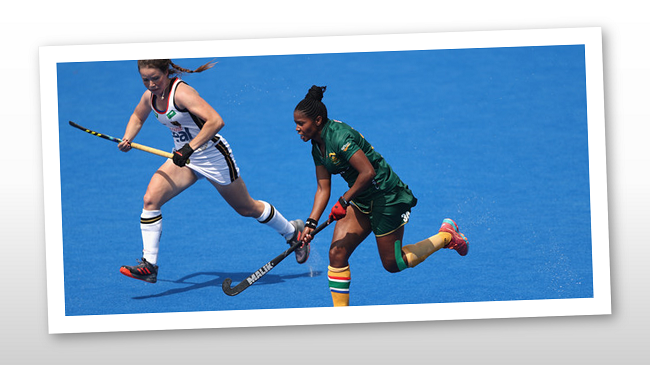 South Africa were kept in the game by a splendid display from Phumelela Mbande. The Article Clerk goalkeeper continues to get better with each game for the national side and is a joy to watch. As much as she was in form she could not stop Viktoria Huse from giving the European’s the lead. In the second quarter the South African ladies grew into the game holding a bit more possession even rallying after Nicolene Terblanche was taken from the field for concussion testing after a fierce strike to the head. Fortunately, Nicolene has been given the all clear and confirmed this with me after the game ending. In the third quarter South Africa would have been disappointed to concede so early in the period after a sensational Phumi Mbande shoulder save almost denied the Germans only for Charlotte Stapenhorst to finish the rebound. 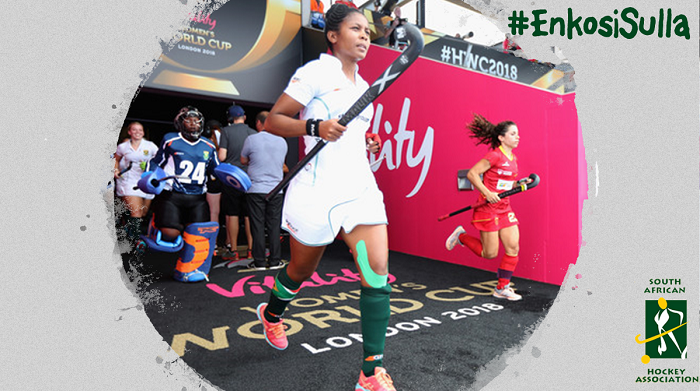 South Africa refused to lie down though and a combination of great saving from Mbande and superb last ditch defending particularly by Kara-lee Botes and Erin Hunter (who got stitches in the finger as a reward for her efforts). South Africa then were awarded a penalty corner which Lisa-Marie Deetlefs finished superbly. Germany were unfazed and while the likes of Kristen Paton and Ongi Mali tried their level best, Germany continued to surge and the pressure eventually told when a review for a penalty corner was awarded a stroke. Huse stepped up to fire it home and make it 3-1, which would remain the score at the completion of the game. Its back to the drawing board for Rostron and the team as they look to mastermind a victory over Spain on Thursday, which will keep their hopes alive in the tournament.